How i can add Meta title for those pages for Article pages. I have created Menu of single article. I would better suggest you to totally remove the meta title tag as it is superfluous and a waste of code. It doesn't really add any value to the page. 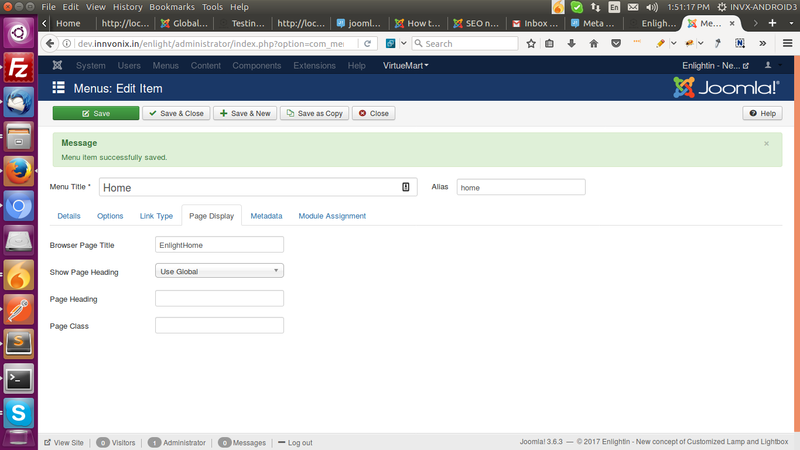 Actually it shouldn't be there at all on a fresh Joomla! 3 site, as it has been removed in recent J versions, and plus there is no UI control to enable/disable it anymore. So I guess this is an older updated website, which somehow inherited this setting from your old configuration file. To remove it, just open your configuration.php and find the corresponding variable - public $MetaTitle = '1'; and delete it. ...meta tag usage. Thanks for explaining in the comments there. In joomla this is not really provided in by default, however it'd be easy to add it to your template. This assumes you're using a fairly normal Joomla template, it may be different if your template is a gantry, helix or t3 type thing from a template shop. For more notes on this, see How to check what component is being used on current page? Not the answer you're looking for? Browse other questions tagged joomla-3.x articles seo or ask your own question.